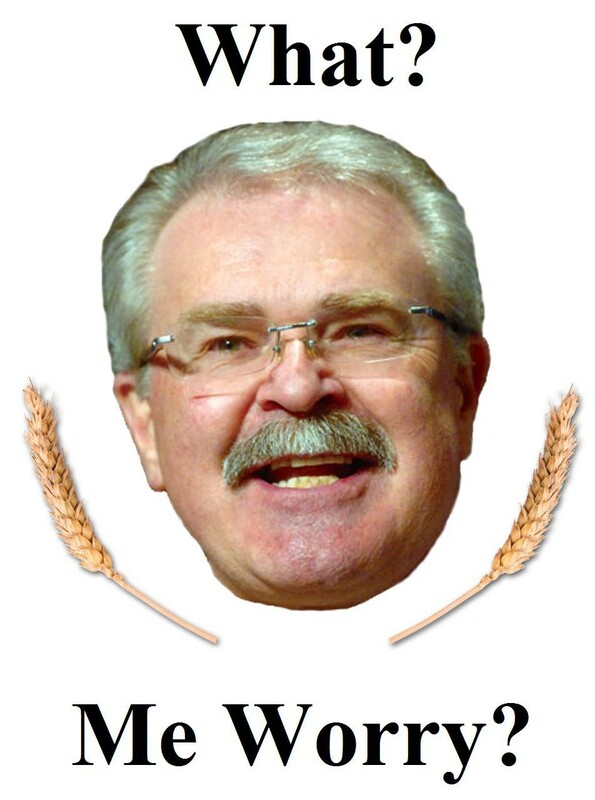 (July 7, 2016) Prairie farmers may remember former Harper Ag Minister Ritz assuring us that killing the Wheat Board would mean grain shipments would flourish. Grain bin salesmen he said would be unhappy because without the Wheat Board grain shipments would go so quickly that farmers would no longer be interested in storing grain on their farms. The exact opposite has happened. There is now a grain storage arms race on the prairies. On the one side farmers are expanding their own on-farm storage capacity and on the other the grain handling companies are building up their inland storage capacity. The only catch is that prairie grain farmers will be paying for it all, either directly out of their own pockets or in the form of lower grain cheques as the private companies recoup their investments. A more fundamental reason for this goes back to a defect in grain and food markets which even Socrates noted some 2,300 years ago: when there is a good harvest, grain is worth almost nothing in the market and yet scant months later, its value jumps. Both market prices are irrational. The political-economist David Ricardo characterized irrationally low post-harvest prices with the term “elasticity of prices” by explaining that “peoples’ bellies are not elastic” and consequently they will pay little or nothing for food once their stomachs are full. So the arms race in storage is really yet another manifestation of this old wisdom. Grain companies know that post-harvest farmers, especially younger ones, have bills to pay which presents the companies with a fine opportunity to purchase grain at a discount then dribble it onto the market later when prices are higher. This is also why well-established farmers now want to hold grain in on farm storage. On my last trip from Alberta down Saskatchewan’s highway 14 to Saskatoon I was struck with all the new bin space farmers along that road have built in the last few years. These are not just a few hopper bins on skids – a lot of them are very large steel bins on concrete worthy of grain elevators from the past. Even the cautious Parish and Heimbecker has seen fit to expand one of their terminals with what appears to be a large circus tent adjacent to their more substantial inland terminal. All of this construction is designed, in one way or another, to take advantage of a defective food market. Farmers are seeking to avoid being the victims of speculators and the grain companies are seeking to be speculators. This defective market was addressed by the Saskatchewan farm leader Ed Partridge in the 1910s when he suggested price pooling and a single-desk seller for grain. He did not live to see prairie farmers successfully implement the ideas of price pooling and the long success of the single-desk farmer controlled Canadian Wheat Board. Nor did he live to see its destruction by the Harper Conservatives and their less than thoughtful agriculture Ministers. The prairie arms race in grain storage has once again shown that the simple nostrums of the Harper era were the product of short-sighted thinking and a basic innocence about commodity markets at best or vicious greed and stupidity at worst. Whatever the reason, prairie farmers will pay for it all. Ps: When I was browsing in the independent book store McNally Robinson in Saskatoon I noticed a book launch featuring a local musician, B.D. Willoughby, and one of the songs on his new album is called “The Ballad of Ed Partridge.” It’s a good summary of what Ed Partridge stood for. We can continue to say “We told you so” but does anyone care any more. Farmers should be angry and they are not. Have they all just given up????? Darrell: excellent question. From what I see and hear a lot of farmers are very angry as they find out how little bargaining power they have with the private giants of the grain trade as they face “take it or leave it” contracts and little or no premiums for things like high protein wheat. Some are attempting to achieve economies of scale by the renting more land and using low interest rates to purchase equipment and crop inputs. However, in auction sale catalogues across the prairies the usual retirement farm sales are being crowded by mega-farm sales listings. Some people say the days of the single-combine farm are numbered but we all see the multi-combine farm sales everywhere. The more watchful farmers are observing the collapse and sale of these mega-farms across the prairies. The bigger mega-farms also bring down the local businesses who supplied them with inputs or leave creditors holding the bag. 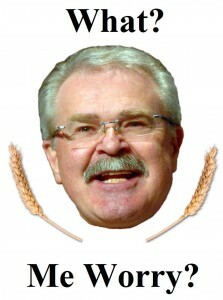 The private grain handlers are now fat and happy. But once the euphoria of renting land and buying new equipment fades, how long will the remaining optimism last in the Prairie farm community?